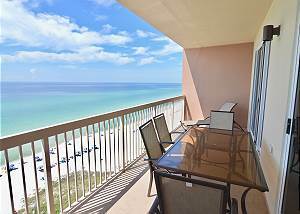 Beautiful 11th floor vacation rental with room for 8. Free Beach Service from March through October. Bedding set up: King, Queen, Twin Bunks, Queen Sleeper Sofa. You'll love it! Upscale condo with room for 6! Here's the bedding set up: King, Queen, Queen Sleeper Sofa! This large 3 bedroom 3 bath vacation rental offers you plenty of room and great views. Here's the bed set up: King, Queen, 2 Twins..
Beautiful roomy vacation rental with room for 8! Here's the bedding set up: King, Queen, Queen, Queen Sleeper Sofa! Free beach service from March through October! Come and enjoy! Great views from the living room and the master bedroom. Room for 7. Enjoy this spacious vacation home that's close to Pier Park and other attractions! Gulf World is right down the street. Beautiful 2bedroom with bunk room! Bedding set up is: King, Queen, Twin Bunks, Queen Sleeper Sofa. Room for 8! Free beach service from March through October! 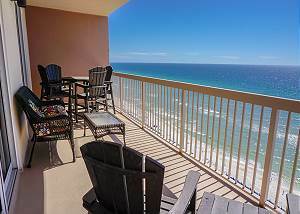 19th Floor Beachfront condo with room for 9! Here's the bed set up: King, Queen, Twin over Full Bunk, Queen Sleeper Sofa. Free Beach Service from March through October!